(Making the sauce) Start from making the Sauce. Mix all the ingredients in a jar. 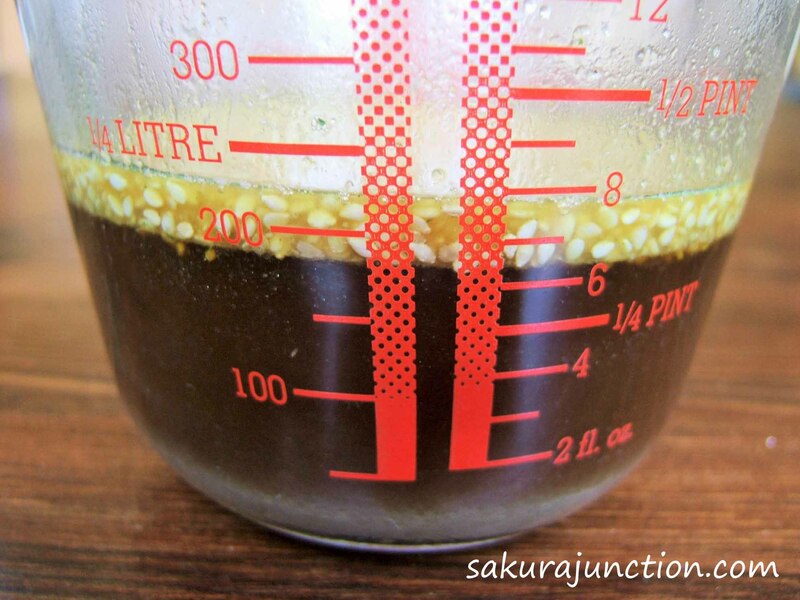 By adding all it should make over 200ml. Chill the sauce in a refrigerator way before eating but if you don’t have enough time, place the mixed sauce in a freezer for 15 minutes or so. 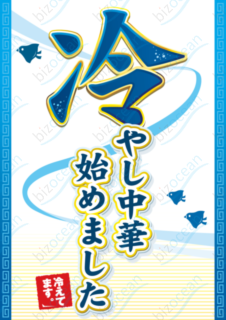 (‘Kinshi Tamago‘) ‘Kinshi’ means golden thread and ‘Tamago’ means Egg. 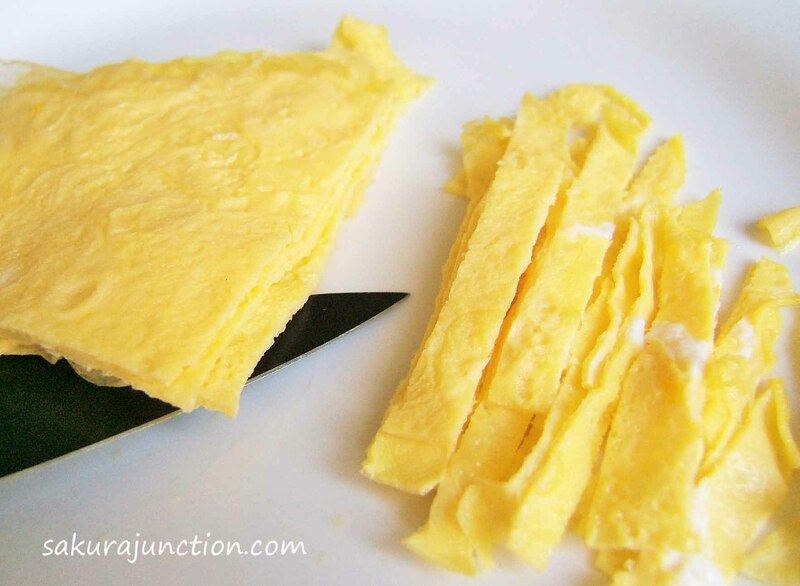 So it is basically Shredded Egg like Golden Thread. 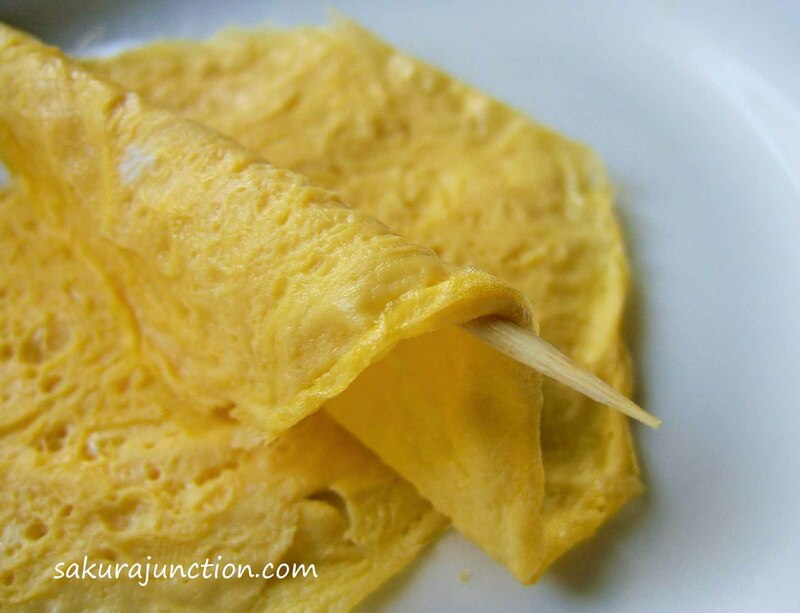 Break 2 eggs and make some very thin plain omlet on a lightly oiled frying pan. Keep the sheets of cooked egg on a plate to cool down. Cut them into narrow strips. *In this photo I could not cut thinly enough but it should be narrower normally. (Boiled Egg) Make a boiled egg if you want to have some on top as well as ‘Kinshi Tamago’ either hard or soft-boiled to your taste. (Salad) Cut all the salad ingredients into thin easy-to-eat size slices. (Noodle) Boil enough amount of water and cook noodle. Keep stirring so the noodle doesn’t stick each other and do not over cook it either. 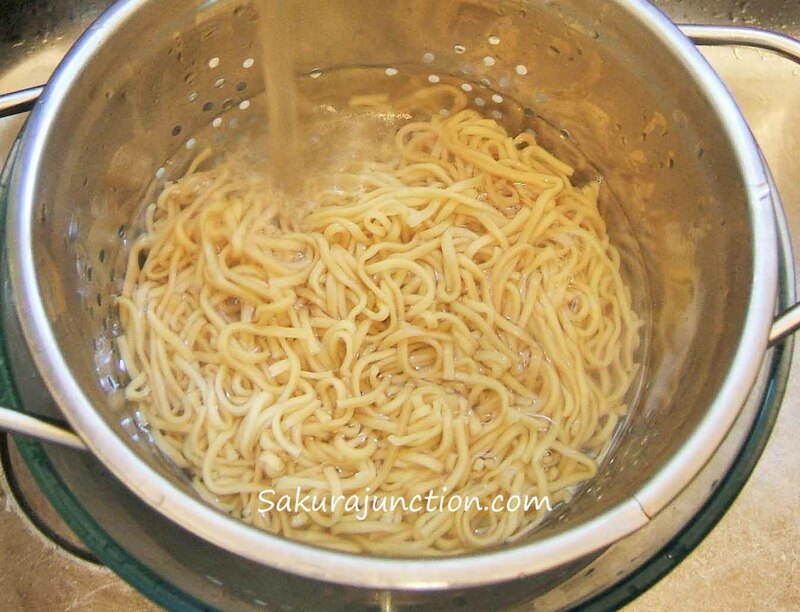 As soon as the noodle is cooked throw the hot water away and rinse noodle under running cold water. Drain the noodle in a colander. (Serve Up) Shake the colander well to remove excessive water from the noodle and place it on a plate with some slight depth. 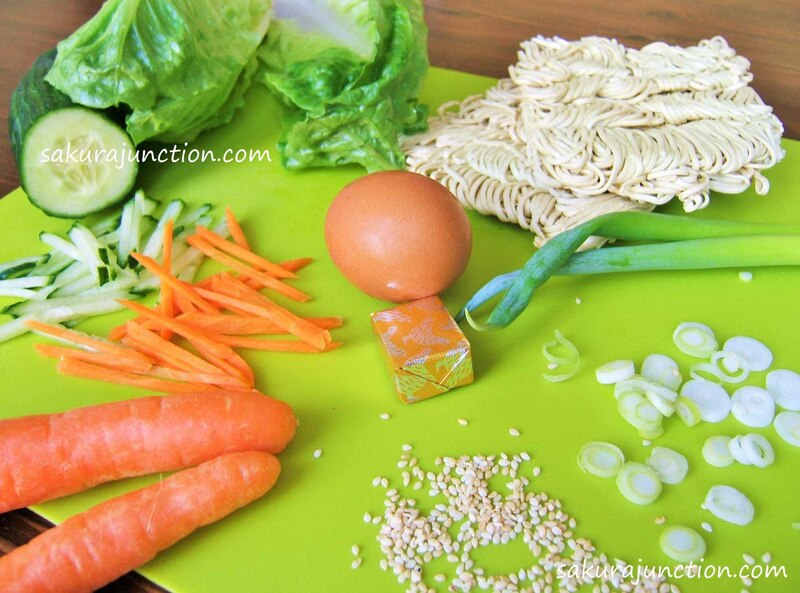 Plate up all the salad ingredients and egg on top of the noodle. Pour the chilled sauce over the plate and garnish with thinly shredded fresh ginger and finely sliced spring onion. That’s it! This is the dish we have every summer. It is the dish that makes us survive the heat. Use Rice Vinegar. Wine Vinegar is too strong for this dish and I don’t think the flavour matches well. You can buy toasted White Sesame Seeds either whole or grounded. 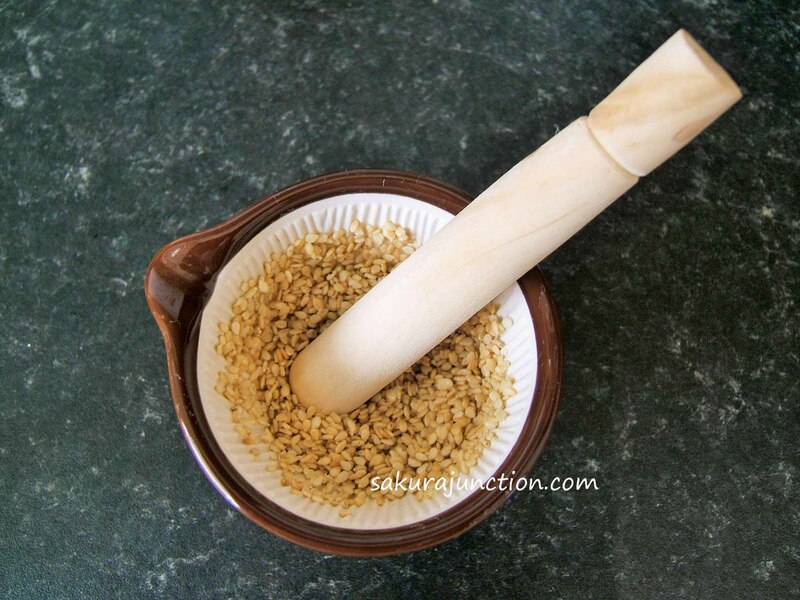 If you have sesame seeds which are not toasted yet just place them in a heated frying pan without any oil. Toast them until the seeds become light brown and an aromatic smell rises. For grinding sesame seeds Japanese people normally have a small gadget to do that job but you can use a mortar for a minute. By grinding just before use the aroma is much stronger and tastier. I used this tiny mortar I bought in Japan. 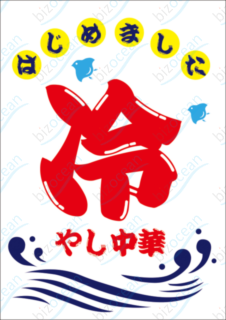 This is from a ‘Hyakkin’ shop that is a Japanese version of a pond shop but so much better quality. Actually the price is about 60 pence since the exchanging rate at the moment. If you prefer we often use some thinly cut ham for this dish and lots of people like to add some mayonnaise to go with it. I did not use mayonnaise just because I don’t like it much. Looks delish! Hitoshi has been practicing making ramen noodles from scratch. It’s been fun taste testing them andcI think they’d go well with your recipe. Lovely. Making Ramen noodle from scratch is one of the things I’d really like to try. I have made Japanese Soba noodle but it was not great. Hitoshi tried to make soba at New Year’s one year and it was a disaster. We’ll keep trying! I think humidity, temperature, ingredients (we had trouble finding the right flour) and even the rolling are all so important. Did your noodles fall apart?? Hitoshi bought an Italian pasta maker to make the ramen noodles. It’s fun to see his progress! We’re actually making tantanmen tomorrow for dinner. Yes, my soba became much shorter when it was cooked. It seems like Soba (Buckwheat noodle) making is very tricky. The timing & the way to add water is the key element. I am also considering to get noodle maker maybe from the ‘P’ company. Is yours Italian? Hmmm… I’ll have to let Hitoshi know about your soba experience. I think he’d be interested. Yes! Hitoshi bought a Made In Italy pasta maker. The brand is imperia. It’s got a bunch of extra attachments you can buy but he bought the basic one that makes flat pasta sheets and Hmmm…. spaghetti thickness I think. 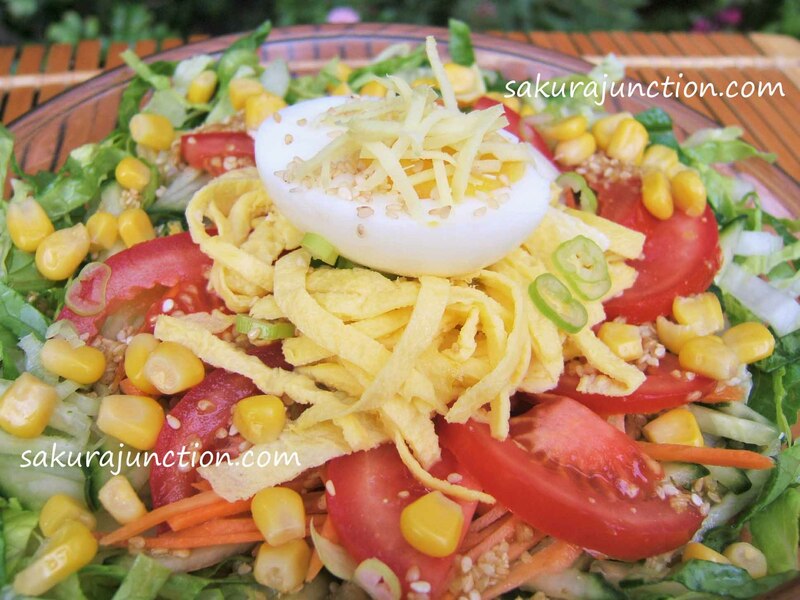 These days most people have shortened the name of the chilled ramen salad and refer to it as simply Hiyashi Chuka. 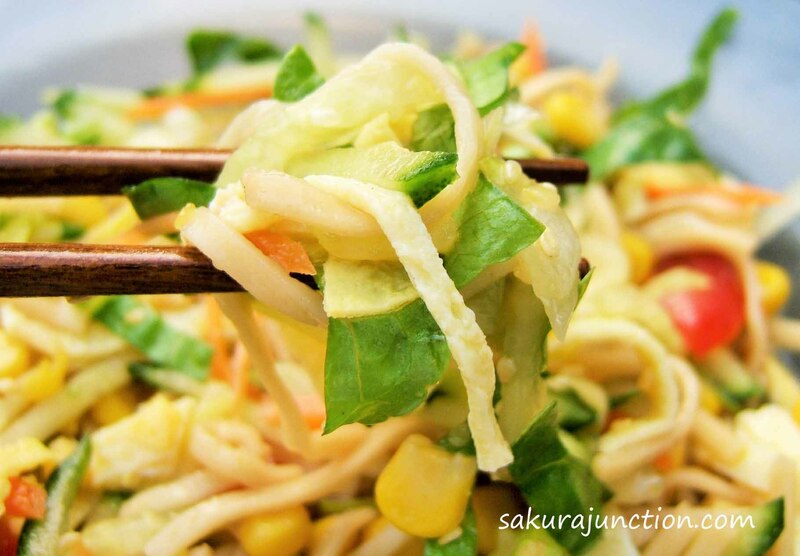 A bed of chilled noodles topped with a vibrant patchwork of color, Hiyashi Chuka is the kind of dish that gets your appetite going when all you can think about is jumping into an ice-cold pool. 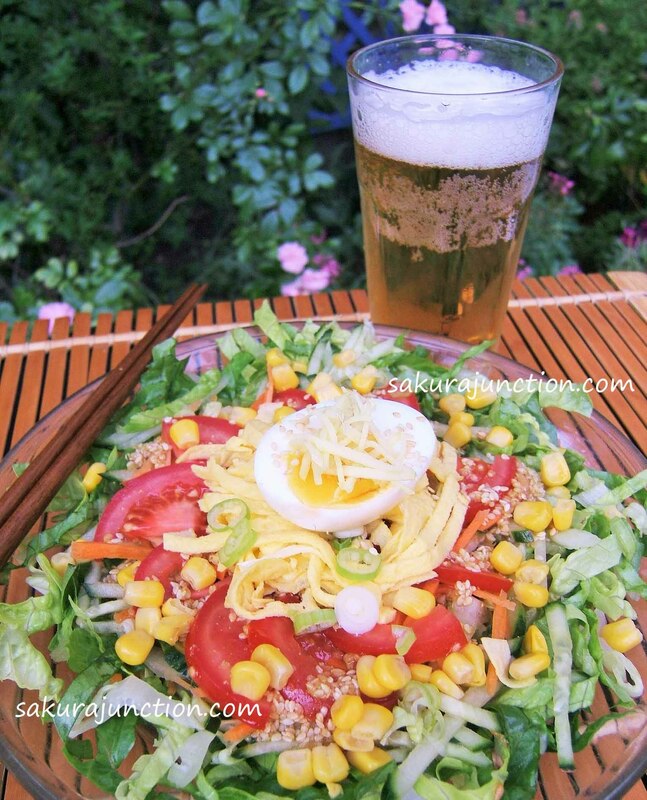 Yes, it is ‘Hiyashi Chuka’ in Japanese. Great that the original name is becoming well known among western people. Your description of the situation ‘the appetite for Hiyashi Chuka’ and ‘jumping into a pool’ is just spot on!